IAC updates its 1-page educational sheet for patients and staff: “Hepatitis A, B, C: Learn the Differences"
Influenza season has begun; be sure all your patients are getting vaccinated! Medscape video commentary discusses the ethical question: Do children have vaccination rights? The Advisory Committee on Immunization Practices (ACIP) met in Atlanta on October 24�25, 2018. During the meeting, two votes were taken on (1) adding homelessness as a risk group for routine hepatitis A vaccination and (2) adoption of a new design framework for the child/adolescent and adult immunization schedules. In addition, ACIP heard presentations regarding the impact of PCV13-vaccinated children on the incidence of pneumococcal disease in adults over age 65. Vaccinated children indirectly improve the level of protection afforded to adults age 65 and older. Information also was presented on HPV vaccine safety, including the results of an extensive study that found no relationship between HPV vaccine and primary ovarian insufficiency. The meeting also included a report on influenza vaccine effectiveness in preventing influenza-associated hospitalizations during pregnancy. Possible future changes were reviewed for the dosage amount for Fluzone vaccine (Sanofi Pasteur) for children 6–35 months of age and Tdap revaccination recommendations. The committee also heard updates on Japanese encephalitis and anthrax vaccines. In a presentation of general interest, CDC’s Dr. Andrew Kroger provided a review of the General Best Practice Guidelines for Immunization website, including revisions that have been posted to the site since April 2017. Because the Guidelines are updated on a regular basis, they are no longer published in the MMWR and may be accessed only online. Dr. Kroger noted that all errata and updates to the Guidelines are listed chronologically on the "List of Errata/Updates" web page at www.cdc.gov/vaccines/hcp/acip-recs/general-recs/general-recs-errata.html. He also emphasized that continuing education credit is available for completing the Guidelines review course. In response to multi-state outbreaks of hepatitis A among homeless populations, ACIP voted to include this group in the list of persons routinely recommended to receive two doses of hepatitis A vaccine. Due to difficulty in maintaining proper hygiene and crowded conditions in shelters, homeless persons are at greater risk of hepatitis A infection and transmission. Operationally, a routine recommendation allows the opportunity for homeless persons to be vaccinated in familiar settings where they routinely receive medical care. ACIP acknowledged the administrative challenges of delivering the vaccine, including record keeping issues. However, the committee felt these challenges were outweighed by the eventual increase in herd immunity in this group, lessening the incidence of disease transmission. Recent surveys conducted by CDC indicated healthcare providers were frequently confused by the format of the current child/adolescent and adult recommended immunization schedules. Guided by information gleaned from these surveys and in-depth interviews with providers, CDC workgroups redesigned both schedules to make them more visually appealing and user-friendly. ACIP voted to approve this new format beginning with the schedules to be published in February 2019. Among other changes, the 2019 schedules will include new colors to visually indicate vaccine precautions and recommendations for temporarily delaying certain vaccines, such as during pregnancy. The schedules also will contain brief “notes” rather than the detailed and frequently overlooked footnotes. Information in the notes will be limited to routine recommendations, with users referred to other documents for non-traditional recommendations such as outbreak control. Importantly, both schedules will now include a list of vaccines, abbreviations, and trade names. A full summary of the adopted changes will be published in IAC Express when the new schedules are issued. All recommendations approved by ACIP are provisional until they are approved by the CDC director and published in MMWR. Presentation slides from the October meeting should be posted on the ACIP website in the next 4–6 weeks. The Association of State and Territorial Health Officials (ASTHO) is the national nonprofit organization representing public health agencies in the United States, the U.S. Territories, and the District of Columbia, and over 100,000 public health professionals these agencies employ. ASTHO’s mission is to support, equip, and advocate for state and territorial health officials in their work of advancing the public’s health and well-being. On October 25, ASTHO issued a press release expressing alarm that the decline in vaccination rates in the U.S. fostered by the anti-vaccination movement could lead to serious infectious disease outbreaks, especially during flu season. A statement in the press release by Nicole Alexander-Scott, ASTHO president and director of the Rhode Island Department of Health, is reprinted below. Vaccines prevent diseases. It is absolutely paramount that public health and healthcare professionals across the nation join together to share the facts about the safety and efficacy of vaccines. The health concerns that parents have over the risks of vaccination need to be addressed with compassion and with care, but also with facts so that informed decisions can be made, and so that people can protect themselves and their loved ones from dangerous, vaccine-preventable diseases. Read the full October 25 press release: Health Officials Alarmed by Declining U.S. Vaccination Rates, Country Could Face Scenario Like Europe's Measles Outbreak. CDC published Update: Influenza Activity—United States and Worldwide, May 20–October 13, 2018 in the October 26 issue of MMWR (pages 1178–1185). A summary made available to the press is reprinted below. CDC recommends yearly influenza vaccination for everyone 6 months of age and older without contraindications. CDC recommends getting vaccinated by the end of October; however, vaccination should continue throughout the influenza season as long as influenza viruses are circulating. While annual influenza vaccination is the best way to prevent influenza and its potentially serious complications, prescription influenza antiviral medications can be used to treat influenza illness. Early treatment is recommended for patients with influenza illness who are very sick or who are sick and at high risk for influenza complications. Antiviral medications can shorten the duration and severity of illness and help prevent more severe illness; they work best when started within 48 hours of symptom onset. This article summarizes influenza activity in the U.S. and globally from May 20 through October 13, 2018. While influenza A (H1N1)pdm09, influenza A (H3N2) and influenza B viruses were identified, influenza A(H1N1) predominated in the U.S. and globally in most regions. Summertime influenza activity in the United States has been low and influenza activity in the Southern Hemisphere during their influenza season has been relatively low and fairly mild. Antigenic testing of available influenza A and B viruses has not detected significant antigenic drift in circulating viruses. It is difficult to predict which influenza virus will predominate or how severe influenza disease activity will be during the 2018–2019 influenza season. CDC published Influenza A(H3N2) Variant Virus Outbreak at Three Fairs—Maryland, 2017 in this week’s MMWR. A summary made available to the press is reprinted below. People at high risk for serious influenza complications should avoid pigs and swine barns because of the risk of contracting a variant type of influenza that circulates in pigs. In 2017, an outbreak of variant influenza—human infection with influenza viruses that normally circulate in swine—was detected in Maryland. Influenza A(H3N2) variant virus infection was identified in 40 patients with exposure to swine at one of three Maryland agricultural fairs. More than one-third (35%) of patients reported only indirect contact with swine. Sixty percent of patients were children younger than 5 years. Three-fourths of these patients were at high risk for serious influenza complications (age <5 or ≥65 years, or a chronic medical condition). This outbreak highlights the risk, particularly among children, for contracting variant influenza virus at agricultural fairs, and underscores the need for increased public awareness that people in high-risk groups should avoid pigs and swine barns. Using IAC's "Favorites" drop-down tab at the top of every immunize.org web page, you will find 18 of the most popular web sections on IAC's content-rich website. Access the Favorites web page instantly by clicking on the "Favorites" drop-down tab at the left-most end of the 6 blue tabs that run across the top of every page of immunize.org. When users hover over this tab with their mouse or click on it, the Favorites web page content will appear. Just click on the "Favorites" tab to visit the Favorites web page to find the most utilized content on immunize.org. Additional resources, including information booklets for patients, are available in the full October newsletter. On October 24, the U.S. Food and Drug Administration (FDA) issued a news release announcing its approval of of Xofluza (baloxavir marboxil; Shionogi & Co., Ltd.) for treating acute uncomplicated influenza in patients 12 years and older who have had flu symptoms for no more than 48 hours. View the complete October 24 news release on the FDA website: FDA approves new drug to treat influenza. IAC recently updated its 1-page educational sheet for patients and staff: Hepatitis A, B, C: Learn the Differences. Changes were made to add "People with HIV infection" to the list of those who should be tested for hepatitis C virus, to update the morbidity data for hepatitis B and hepatitis C, and to add the recently licensed 2-dose hepatitis B vaccine (i.e., Heplisav-B). Changes were made to each of them to remove the instructions for administering the intradermal presentation of influenza vaccine since this formulation is no longer available. IAC recently revised Recommendations for Pneumococcal Vaccines Use in Children and Teens to remove the references to PCV7 vaccine (last doses expired in March 2011) and to add chronic liver disease and alcoholism as risk factors for children to receive PPSV23 vaccine. IAC recently revised Standing Orders for Administering Meningococcal ACWY Vaccine to Children and Teens to add information to section #4 (Prepare to Administer Vaccine) to clarify that only the Menveo (GSK) vaccine can be used in infants ages 2 through 8 months. Menactra (Sanofi) vaccine is licensed for people ages 9 months and older. IAC recently revised its 1-page guidance for healthcare professionals titled DTaP, Tdap, and Td Catch-up Vaccination Recommendations by Prior Vaccine History and Age. Changes were made to state that children 7 years or older with an incomplete history of DTaP should be given Tdap as the first catch-up dose and should also receive an additional Tdap at 11–12 years. Previously the guidance said they "may" receive this additional dose of Tdap at age 11–12 years. CDC published Update on Vaccine-Derived Polioviruses—Worldwide, January 2017–June 2018 in the October 26 issue of MMWR (pages 1189–1194). On the same day, WHO's Weekly Epidemiological Record published a similar article titled Update on Vaccine-Derived Polioviruses—Worldwide, January 2017–June 2018. A media summary of the MMWR article is reprinted below. Vaccine-derived polioviruses will continue to cause rare outbreaks and infect individuals with immunodeficiency until all use of oral poliovirus vaccine can cease after wild poliovirus transmission is eradicated. All countries must maintain high population immunity to polio through vaccination. Vaccine-derived polioviruses (VDPVs) are strains genetically divergent from the oral poliovirus vaccine (OPV) that fall into three categories: 1) circulating VDPVs (cVDPVs) from outbreaks, 2) immunodeficiency-associated VDPVs (iVDPVs) from patients with primary immunodeficiencies, and 3) ambiguous VDPVs (aVDPVs) that cannot be more definitively identified. During January 2017–June 2018, new cVDPV outbreaks were identified in the Democratic Republic of the Congo, Kenya, Nigeria, Papua New Guinea, Somalia, and Syria. Six newly identified persons in four countries were found to excrete iVDPVs. Influenza season is now under way, and CDC has reported 1 pediatric death from influenza in the U.S. prior to October 20. Last season, there was a record-setting number of pediatric deaths in the U.S. (172), so be sure to protect all your patients for whom vaccination is recommended. CDC has stated in its Weekly U.S. Influenza Surveillance Report, FluView, that as of the week ending October 20, local influenza-like illness (ILI) has been reported in four states (Massachusetts, New Hampshire, North Dakota, and Oregon), with sporadic ILI reported in 44 states. No ILI was reported for Illinois, Mississippi, Rhode Island, and Virginia. Please help PIDS spread the word to members of your organization, partner organizations, vaccine providers, trainees, and others. 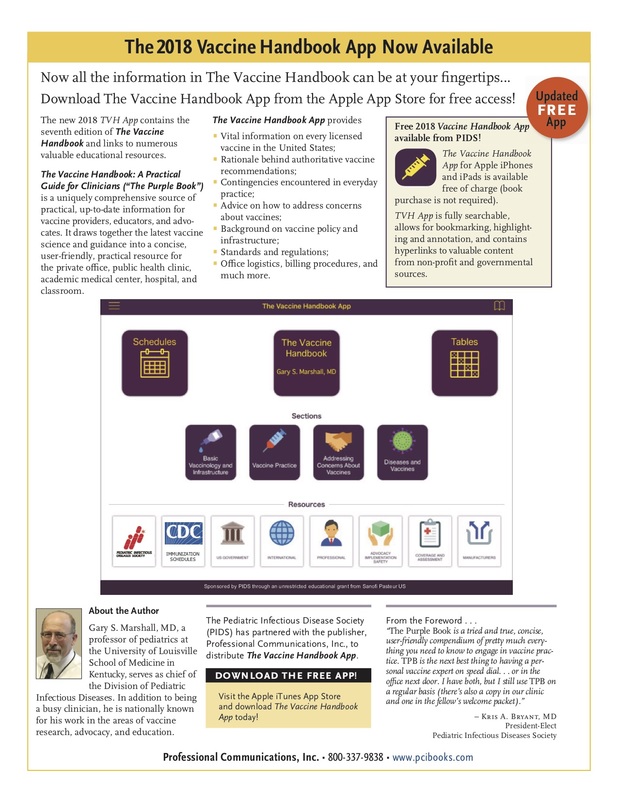 The App may be found by searching the App Store for “The Vaccine Handbook App” or clicking on the following link: https://itunes.apple.com/us/app/the-vaccine-handbook-app/id1043246009?mt=8. Additional information about The Purple Book is available through the publisher, Professional Communications, Inc. (West Islip, NY) at https://pcibooks.com/books/view/49. Medscape has recently posted a video commentary titled Do children have vaccination rights? featuring Art Caplan, PhD, Division of Medical Ethics at New York University School of Medicine. Dr. Caplan presents the moral stance that every child has the right to be vaccinated and that the vaccine debate needs to start off with the rights of children rather than the rights of parents. CDC published Translocation of a Stray Cat Infected with Rabies from North Carolina to a Terrestrial Rabies-Free County in Ohio, 2017 (pages 1174–1177) in this week's MMWR. A summary made available to the press is reprinted below. The movement of a rabid animal to a rabies-free area nearly jeopardized a multi-million-dollar USDA effort to contain the raccoon rabies virus. Public health officials quickly responded and were able to prevent the spread of this infection, averting a very costly emergency vaccination response. Stray animals that are rescued or adopted should receive immediate veterinary care and a rabies vaccination. Owners should avoid interstate travel until their animals are in compliance with local and state regulations including up-to-date rabies vaccination. Each year the Centers for Disease Control and Prevention receives reports of approximately 5,000 rabid animals. Vaccination of dogs and cats remains the best preventive measure. Among domestic animals, unvaccinated cats are now the most common rabid animal in the U.S. In this report, an unvaccinated cat was adopted and taken across multiple states to a rabies-free area in Ohio, where it then developed rabies. Laboratory analysis proved that this animal did not acquire the disease in Ohio and was an isolated event, averting the need to conduct costly emergency vaccination programs in this community. The rapid response by public health prevented further transmission of the virus by quarantining exposed animals and identifying individuals that required prophylaxis. CDC publishes Measles Outbreak in a Highly Vaccinated Population—Israel, July–August 2017 in the October 26 issue of MMWR (pages 1186–1188). A summary made available to the press is reprinted below. In outbreak settings, health care providers should maintain a high index of suspicion for measles, regardless of vaccination status, and conduct a thorough epidemiologic and laboratory investigation of suspected measles cases. During the summer of 2017, nine measles cases occurred among vaccinated Israeli soldiers. The primary case had recently traveled to Europe. All other cases were his direct contacts. All patients had mild illness; no tertiary cases occurred. Unlike most previous outbreaks in Israel, which occurred in unvaccinated or partially vaccinated populations, this outbreak occurred in a population with high two-dose measles vaccination coverage. Because of the mild symptoms, without active surveillance the possibility of measles would likely not have been considered and circulation of the virus might have continued. The fact that most contacts were fully vaccinated probably contributed to rapid containment. Free continuing education credits will be offered, and the event archive will be available later during the week of the event. Current Issues in Vaccines webinars are co-sponsored by the Pennsylvania Chapter, American Academy of Pediatrics and supported by the Thomas F. McNair Scott Endowed Research and Lectureship Fund.